Should You Use a Treadmill Desk at Work? Sitting at the computer or office desk all day is bad for you in many ways. More and more we hear about how sitting raises our health risks. Is one answer to put your computer workstation on a treadmill and pace the day away as you work? A small study of 15 obese office workers had them walk and work at a vertical computer workstation on a treadmill at the slow pace of 1 mile per hour. They burned an extra 100 calories per hour. If they used the treadmill workstation for 2-3 hours a day, the researchers estimated they could lose 44-66 pounds per year (20-30 kilograms). That's an extreme estimate, which assumes they didn't make up the calories with an extra snack or sugared drink. Actual weight loss over a year of using a treadmill desk was studied in a 2013 paper. They followed 36 subjects who used a treadmill desk for an average of an hour a day, losing an average of 1.4 kilograms (3.1 pounds). The subjects who were obese lost more — an average of 3.4 kilograms (7.5 pounds). That's more realistic and shows what is more likely to happen in the real world. 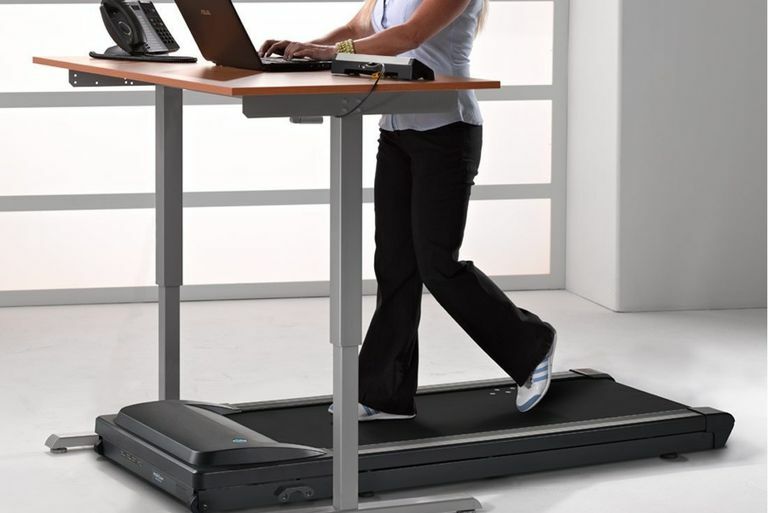 Slow walking at only one mile per hour is the key to using a treadmill desk for long periods of time while working. A normal walking pace down a hallway or street is 2.5 to 4 mph. The slow walk can take a little practice. Those using the treadmill need to have proper footwear to prevent further problems. I'd recommend proper walking or running shoes rather than heels, dress sandals, flip-flops, or dress shoes. Proper posture is important, whether at a desk or on a treadmill workstation. If you are still hunching over the keyboard, you are now developing poor walking habits in addition to poor sitting habits. You will need to ensure your work surface and computer are set up at the right height. Ergonomics is key to preventing shoulder, neck, and back problems. It's best to slowly increase your time using a treadmill desk. Start with 15 minutes at a time once or twice a day in the first week. See how you tolerate it. After a few days, add shorter bouts each hour of five minutes, which will break up your sitting time. If your goal is weight loss, increase the length of time you use it for 20 minutes and 30 minutes twice a day in the second and third weeks. If that goes well, continue to increase the length of time of each use in the third and fourth weeks. Treadmill manufacturers have responded with treadmills designed to fit under standing desks as well as treadmills with a desk surface instead of a tilted console. Lifespan sells a variety of treadmill desks and treadmill bases that you can use under your own standing desk. The Lifespan TR 1200-DT treadmill desk was voted as the best budget treadmill in our Readers' Choice Awards two years in a row. Their TR5000 DT5 ranks as a Best Buy at TreadmillDoctor.com for treadmill desks. If you already have a home treadmill and a tablet or laptop computer, you might experiment with slow walking while you work on the computer. If you can't get the right angle with the screen when your computer is propped on the treadmill console, look for a standing desk or table (like a hospital bedside table) that is the right height and will extend over the treadmill. Jay Buster wrote about building and using a treadmill desk and losing 16 pounds in four months. His Treadmill Desk blog shows how to he built one for only $49 (not counting the cost of the treadmill). Jay has links to other blogs of those who treadmill as they compute and lots of slides of how others have built their own treadmill desks. Why Not a Bike Desk? My trainer, Roman, thought a recumbent bike desk was a much better idea, for ergonomics and posture. It also would exercise the muscles most in need of crosstraining for someone who was already a fitness walker. I first tried the FitDesk, which is more of a standard bike set-up with a desk surface for a laptop or other work. But I preferred the DeskCycle under-desk exerciser which I use both at home and at work under a regular desk. We asked our readers to tell us about their experiences with treadmill desks. Josh Simms: I have been using the TrekDesk Treadmill Desk for more than a year and have to say it is the best investment in health I have ever made. I had a treadmill at home that we never used. The boredom I feel on a treadmill made it impossible for me to use. Then I found the TrekDesk. It was much more affordable than the other models and it allowed me to have dual use of my treadmill. I replaced the desk at my office with the TrekDesk and have been walking or standing ever since. I sleep better, I have lost weight. I no longer feel guilty about missing a workout at the gym and I have more time in the day to spend with my family. I am a huge fan of the TrekDesk. Jennifer: I had been working at a standing desk that my husband had built over a year ago, but it was not until March of this year that I started walking at my desk. I walk on a TreadDesk treadmill that works perfectly with my standing desk, I just slide it underneath and it has a small control panel that sits on top of my desk. I usually walk at 1.5 mph for at least 3 hours each day, with the longest being 6 hours. I will never go back to sitting all day and believe it is just a matter of time before this really catches on. The mental benefits that I have experienced (more creative, improved mood, increased productivity and no longer feeling sluggish) outweigh the physical benefits of losing weight. Jay: I purchased a TreadDesk in 2008 and it has changed my life. Struggling to lose weight and having lower back pain from an accident, I was desperate for a way to continue working from a home office while addressing both problems. The TreadDesk allows me to sit or stand up and walk which no other product did at the time ( I don't know if others now do). I have lost 28 lbs since I purchased it and now work pain-free. The ability to stand up and walk while working gave my lower back pain immediate relief. I would highly recommend a treadmill desk to anyone that is tied to a desk all day. Robin: I bought the Surf Shelf to put on my treadmill. My hope is that it will help me convert my treadmill into a walking desk. So far, so good! It was easy to install, with helpful photos and drawings, as well as options depending on which machine type I had. It sits at what looks like a funny angle when I first installed it but once I was on the treadmill and had attached the laptop, it was fine for typing. I do have the type of treadmill where I have to move the shelf slightly to turn the treadmill on and off. ArthurRW: I made a wooden shelf that started out as a bookshelf but is the right height and location for laptop access while on the treadmill. I don't do much computer work on the treadmill but I use the laptop as a DVD player and watch movies while walking. The only downfall is getting so involved in the movie I do extra time on the treadmill. Koepp GA, Manohar CU, McCrady-Spitzer SK, Ben-Ner A, Hamann DJ, Runge CF, Levine JA. "Treadmill desks: A 1-year prospective trial." Obesity (Silver Spring) 2013 Apr;21(4):705-11. doi: 10.1002/oby.20121.